Is the day coming when MOOCs will be widely accepted for credit? Some have hailed MOOCs — massive open online courses – as the next great wave in education and important to the future of higher learning. Leveraging the technology of distance learning, MOOCs have opened the doors of higher education to many who otherwise might never see the inside of a college classroom. At the same time, some have raised a red flag, noting that for all the advantages of MOOCs, these programs in the vast majority of cases do not actually confer college credits. The coursework is free or inexpensive, but in many cases there's no credit at the end of the day. Lately, though, a number of initiatives have shown that colleges may indeed be opening themselves to the possibility of offering academic credit even to those who enroll and study entirely in the MOOC environment. Along the same lines, Empire State College (part of The State University of New York system) has announced a plan to bring all its online classes under one umbrella in order to encourage degree completion. The system will encourage top faculty members to build MOOCs, with the intention being that students who do well in certain courses might be eligible for SUNY credit. “It fits within who we are as an institution and we're building on that,” Robert Clougherty, acting vice provost for research, innovation, and open education at Empire State, told ACE. He described the expanded MOOC program as one piece of a larger effort to offer comprehensive education. Perhaps the most striking development in the evolution of for-credit MOOCs has been the decision by ACE to approve five MOOCs for its credit recommendations. The move gives individual institutions the option of granting credit. Two of the approved courses come from Duke University: “Introduction to Genetics and Evolution” and “Bioelectricity: A Quantitative Approach.” Courses on pre-calculus and algebra are offered at the University of California at Irvine, while “Calculus: Single-Variable” comes from the University of Pennsylvania. All five are offered through MOOCs development company Coursera. The council's recommendation carries weight. ACE operates a credit-recommendation service, advising its 1,800 member colleges that they can feel secure in conferring credit on students who have passed that course, according to the Chronicle of Higher Education. 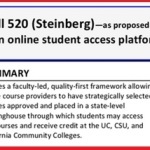 “This could make it much easier for students to get credit for MOOCs, and they don't necessarily have to figure out the complicated, back-roads way of doing so,” Amy Laitinen, deputy director for higher education at the New America Foundation, told the Chronicle. Meanwhile, Georgia State University has also adopted a new for-credit policy for students enrolled in its massive online courses. Students can work with the university's office of undergraduate admissions and academic departments to confirm that they understand the material sufficiently to merit credits. 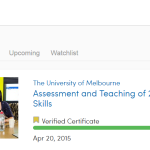 The prospect of a for-credit MOOC has generated enthusiasm in some circles. Academicians may see it as a way to reach far greater numbers of students, while administrators might look to MOOCs as a way to get more prospective learners interested in college life. Students in turn may see for-credit MOOCs as a way to gain inexpensive credits or to accelerate their degree paths. At the same time, some concerns have been raised regarding the possibility to granting credits for open-enrollment online work. There's the financial logic to be considered. If students are paying less for credits, schools in turn are taking in less revenue. This might not be a concern for nonprofit schools, but for private institutions the diminished income could be a sticking point. Issues also arise regarding the transfer of credits. With more students moving loosely between institutions, schools may find themselves deciding case by case, or else en masse, what credits earned at someone else's MOOC may count toward a degree. On the academic side, schools will be challenged to prove to themselves that any given learner has acquired the depth of knowledge sufficient to deserve a college credit. Despite obstacles, the coming of the for-credit MOOC promises to open the doors to yet another variation on the evolving theme of distance learning, as colleges and students alike seek out ways to get the most from these fast-emerging technologies. Have you ever heard of World Education University (WEU)? WEU is a degree granting institution that provides online education tuition FREE. It seems to me that MOOCs are simply a delivery mechanism separate from the credit bearing/evaluative aspects of higher education, thus, I believe that in the future many MOOC’s will be available to matriculated students in credit bearing options, to those who are building e-portfolios for Prior Learning Assessment with modular options and/or the opportunity to earn “badges” and to lifelong learns who just want to sample portions of a learning experience. A single MOOC could be developed to accommodate all of those choices, resulting in a truly self-directed learning experience.